When I looked ahead at the articles I was writing for the rest of the year, I realized that I was used to doing three pieces a week now, and I hope people are used to getting three pieces a week from me. With nothing planned for the Friday slot except for Bond every other week, I decided to ask people for recommendations for small film franchises to watch and write about (on twitter and my tumblr, all the more reason you should be following those!) Most of them were obvious suggestions, but there were a few surprises, like the series starting today. 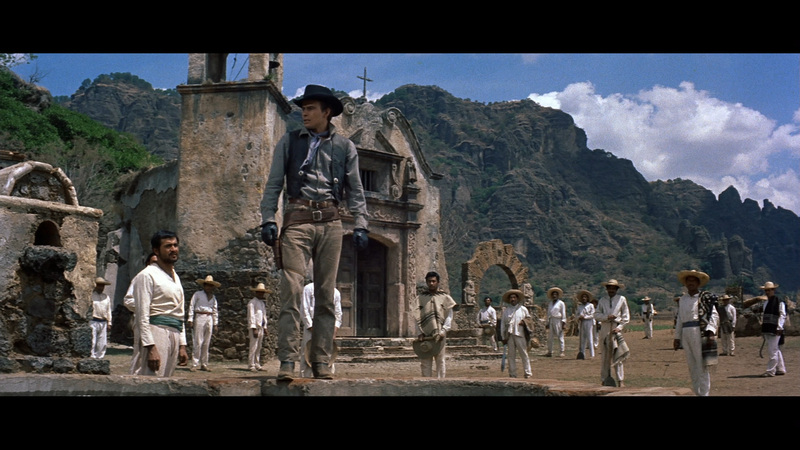 The Magnificent Seven is one of the most notorious American remakes in film history. An adaptation of Akira Kurosawa’s The Seven Samurai (a top contender for most film lists of the best movie ever made), it seems almost baffling looking back that taking that idea and totally Americanizing it not only worked, but created a classic in its own right. 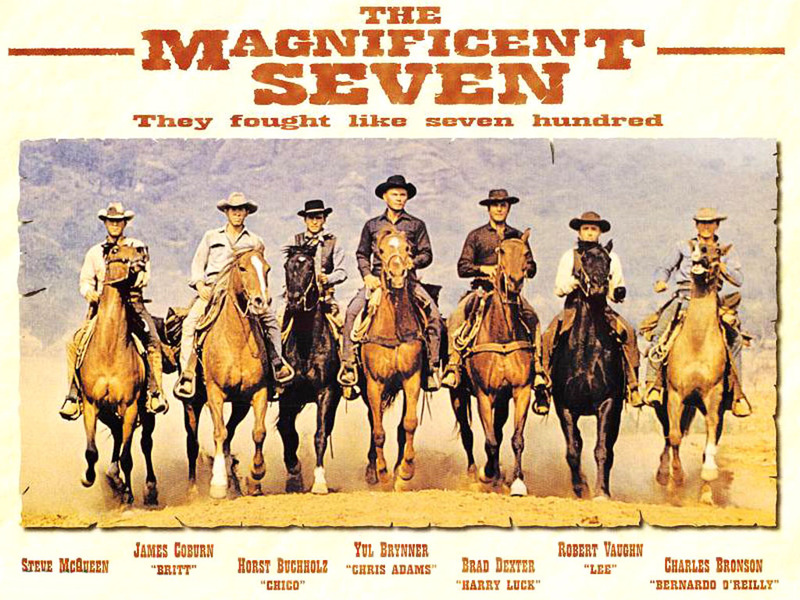 The Magnificent Seven was not only a success, but over the years has grown into a true action classic, a rogue’s gallery of leading men who created such an indelible movie that it spun off into its own series of parodies and homages, as much as the original Seven Samurai. It also, bafflingly, spawned three sequels of its own, with a rotating cast of characters (some playing the same roles) and creating a franchise out of a movie based on a movie where nearly everyone dies at the end. I was so delighted at the idea of four Magnificent Seven movies that I was inspired to create this project: A Series of Sevens, taking a look at all four movies, a descent down a dead end of Western adaptation and a nice, depressing look at how a surprise action classic gets exploited into a franchise. Don’t think you have a monopoly on that, modern Hollywood! I don’t know how much to assume people know about The Seven Samurai/The Magnificent Seven‘s plot going into this write-up, so I’ll be brief. The stories of both movies concern a group of bandits who ride into a remote village and demand food from the poor farmers who live there. The farmers, tired of being bullied and concerned with starvation if the demands don’t stop, decide to pool their meager resources and send envoys out to go and find a group of men to come and fight off the bandits and protect the village. They manage to find one compassionate soul, who then helps them build a team of seven expert fighters, who head back to town to prepare for the inevitable attack, disrupting and then becoming a part of the community in the process. In many ways, it’s here that the similarities between the two movies cease. Yeah, there’s some parallels between who lives and dies, and how each character acts, but in many ways the character of the film is radically changed in the rewriting. Originally, blacklisted screenwriter Walter Bernstein wrote a fairly faithful adaptation of Seven Samurai, but a change in producer when lead Yul Brynner bought the rights to the movie resulted in a rewriter from Walter Newman, creating a script that drifts further away from the original. So by the time director John Sturges came on board, the movie was already its own beast. So I’ll be primarily talking about this movie as it’s own thing, and if you want to compare it to The Seven Samuraithen someone else can take up that mantle. Kurosawa, unsurprisingly, makes the better movie, but I think there’s plenty to recommend this one as great in its own interesting ways. That Yul Brynner was never cast as Lex Luthor is history’s biggest casting tragedy. 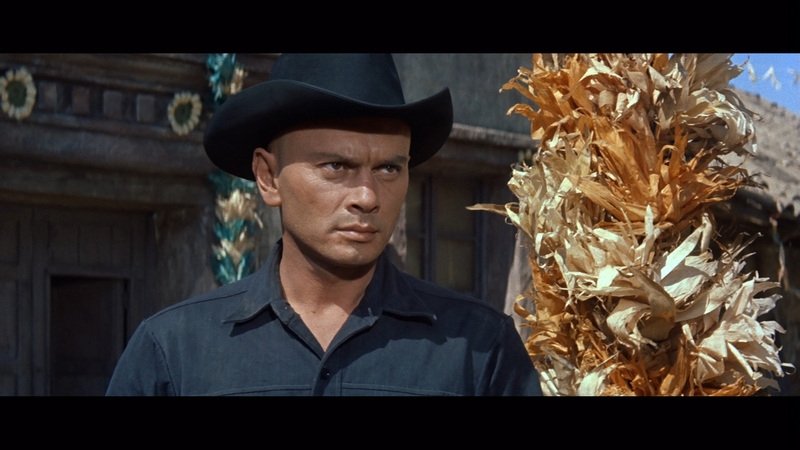 Chris (Brynner): the fastest gun, the obvious hero, and Brynner a damn weird choice for it. With his bald head and tailored cowboy outfit, he looks more like a fashion model doing cowboy than a rough and tumble gunslinger himself. Which is, honestly, most of why he’s amazing in the role. Vin (Steve McQueen): a broke gambler who meets Chris in the street as the two stand up to the small town their in to make sure an Indian is buried in the town cemetery as he should be, above the protests of a bunch of armed racists. McQueen actually faked illness to shoot this picture, foregoing his obligation to his show Wanted: Dead or Alive. Rather famously, Brynner and McQueen spent most of the time on set upstaging one another, and were on incredibly bad terms for most of the production. Harry (Brad Dexter): an opportunistic friend of Chris from some time prior to the film, Harry joins up convinced that Chris is hiding some secret stash of gold or jewels that the town is protecting. He’s supposedly a gunslinger, but is the only one of the seven who ends up with no on-screen kills to his name, spending most of his time trying to scam the secret out of the farmers. Lee (Robert Vaughn): An army deserter who joins up mostly for the opportunity to escape the law that’s after him for a few weeks, leaving with the group instead of remaining a holed up fugitive. 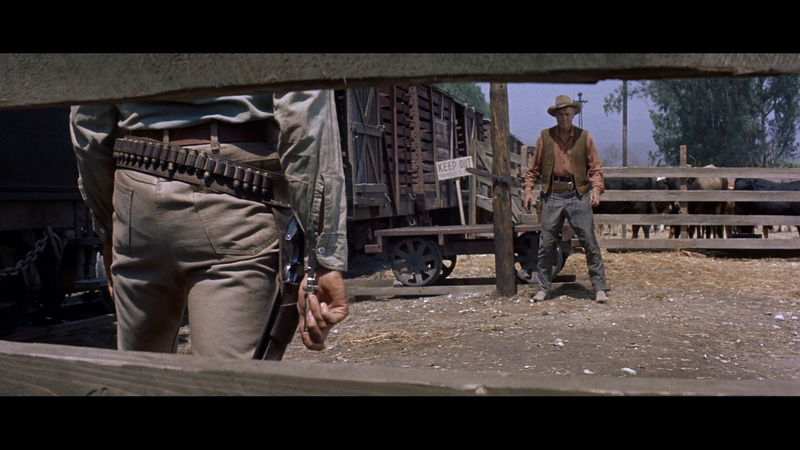 Britt (James Coburn): A taciturn knife-fighter and cowboy that Chris and company come across beating a man in a quick-draw duel with only a blade. The only exception to the ‘never bring a knife to a gunfight’ rule. Coburn was a recommendation of Robert Vaughn, a close friend of his, after Sterling Hayden dropped out of the role. Coburn was a huge fan of The Seven Samurai going into the movie, and probably plays his role closest to how it appeared in Kurosawa’s version. Bernardo O’Reilly (Charles Bronson): The coolest name belongs to one of the coolest guys, an Irish-Mexican gunfighter of renown, who joins up despite the job being ‘beneath him’ to try to reconnect to his Mexican roots and fight perceived injustice, only to end up the de facto mentor of three young boys in the village who idolize him. Chico (Horst Buchholz): A young aspiring gunslinger who rushes to sign up, only to be turned away by Chris after he decides Chico’s too green to ride into certain doom. He ends up trailing the group into Mexico, where they let him join as the seventh and final member, more to keep him out of the way than any perception he’ll be good in a fight. Never bring a gun to a-oh, I did that joke already. Still badass. It’s a pretty crazy cast, not least of which is that many of those guys regularly were leads in their own movies or even their own franchises (lookin’ at you, Bronson) later in their careers. And in a movie with that many personalities, the first hour plus is devoted mostly to building a team, and the interactions between these men and the town, the elaborate plans being laid, and the nebulous threat of Eli Wallach and his banditos. They come to town, try to befriend the villagers, and then spend their time trying to teach them to fight and building defensive walls, all good plans that you know are going to mostly go awry or prove just enough to put everyone on equal ground. From the outset, this is a pretty hopeless fight, and everyone regularly acknowledges that. What I want to talk about, then, is how the themes of the movie play out between the Seven and the town, and where The Magnificent Seven deviates the most and most interestingly from the original. All of the gunfighters, save for Chico, are men who are pretty close to being at the end of their rope. They all express regrets, explaining to Chico after one night where he gets discouraged by their pessimism that being a gunslinger might not mean having concerns or responsibilities, but it also means no family, no land, no legacy. Being entangled with the town leaves them with a sense for a lifestyle that they all left behind a long time ago, a more elegiac approach to the material, rather than the Japanese social classism of the period represented in Kurosawa’s work. Furthermore, after the first brush with the bandits where the seven kick them out of town, Chico dresses like a Mexican and makes his way into their camp nearby to try to figure out their plans. Here he learns the truth: the bandits don’t need food for the winter, they need food now. The men are starving, having not eaten for three days, and only exist on this living picking from villages along their path. Retreat isn’t an option for them. So the seven decide to strike first, immediately, leaving the town to try to rout the camp. But when they get there, they find the camp already deserted, and heading back into town defeated they find the bandits had a similar idea, and came in and occupied the town while the seven were gone, let in by the leaders of the villagers who were having second thoughts about standing up to continued assaults by the bandits. Charles Bronson would go from babysitting kids to nearly outshining Eastwood himself in Leone’s Once Upon A Time In The West. It’s during this parley between Chris and the bandits that an interesting concept comes up: Calvera, the bandit leader, doesn’t see him and the seven as being any different, just a bunch of hired guns who do the job. But he looks at their efforts to enfranchise the villagers as a sort of cultural imperialism, scaring them with the amount of freedom and thus responsibility that Chris is laying on their shoulders to determine their own destiny. “You give them many choices, I give them one, ‘give me what I want'” Calvera explains to Chris. And Chris obviously rejects this, being a cowboy hero archetype, but in reality anyone looking back on this movie knows exactly what Calvera is describing: American guns, riding into the less developed world, and supplanting extant power structures with good old US democracy whether the people were ready for it or not. 1960 was early for these kinds of ideas, so the film never really develops them consciously, but the friction between Calvera, Chris, and the village caught between is an obvious picture of American foreign policy of the era (and now, in many way). You ask for American help, and often people find themselves with more than they bargained for, as a whole philosophy and way of life is imposed along with the arms and know-how, whether people like or or not. Calvera might not be a good guy, but that doesn’t make Chris (Pharaoh himself, a mythic figure of cultural persecution, for anyone raised on Easter showings of The Ten Commandments) or his posse or any of the American movie stars who ride in to save poor uneducated Mexicans any better, even if the movie goes to great lengths to try to cover that up with the typical story. Shot mostly on location, there’s some serious beauty framing the action of this movie. The movie, then, ends much the way the original did. The good guys save the day, but only by having their numbers steamrolled. In the end it’s just Chris, Vic, and Chico left, the town free, and Chris and Vic ready to ride off into the sunset. When Chico decides to stay at the last minute to put down roots and start a family with one of the women he fell for during their stay, Chris is left looking at the row of graves as they leave. “Only the farmers won,” he says. “We lost. We always lose.” Which is fine, a normal sentiment for these types of traditional Westerns that were already starting to struggle as the genre stagnated out of prominence, but it in no way represents the actual truth. They turned the village into exactly what they set out to do, achieved an impossible goal with less casualties than they had expected, and if you want to extend the metaphor earlier further, have indoctrinated the village into American thinking. They can do for themselves, so long as they’ve got Americans looking out for them, a mind-set more than one country found itself in in the 50s and 60s, only to discover how paper thin those ideas were as the years wore on and the situations became more complex than that. If that feels harsh, I hope you don’t think I disliked the movie. I didn’t. It’s a hell of a picture, a bunch of fun and full of great performances. It also has an incredible score from Elmer Bernstein, the main theme of which I have heard countless times not knowing it was from this movie. But I think the cultural context is interesting, as it’s wholly absent from Kurosawa’s version, removed so far as it is from actual Japanese cultural concerns of the time. There’s a relevance, however muddled I think it expresses itself, that The Magnificent Seven has that sets it apart. There’s a restlessness to the movie, even as it ends rather decisively, that seems in the spirit of the cultural zeitgeist of the time. Maybe that’s why there were sequels. I mean, you could say ‘because money’ and be right, too. But I hope that there’s more to it than that. We’ll see, I guess, in two weeks, when we talk about Return of the Seven! 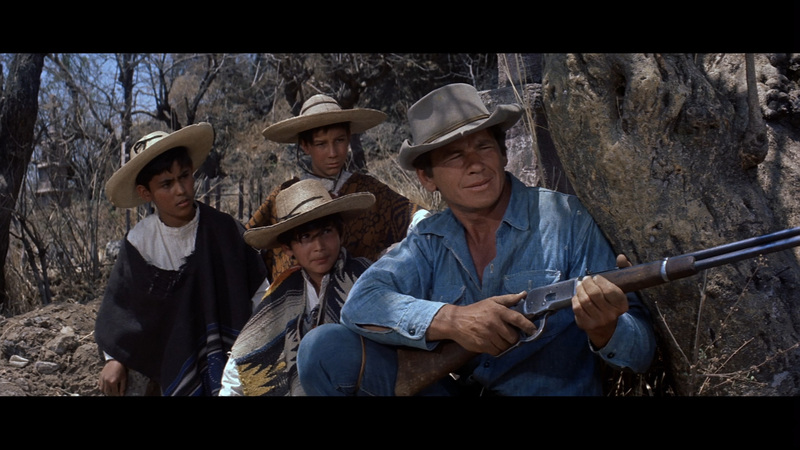 This entry was posted in serious about series, the magnificent seven and tagged 1960, Charles Bronson, film, James Coburn, movies, remakes, Steve McQueen, The Magnificent Seven, western, Yul Brynner. Bookmark the permalink. Pingback: Quentin Tarantino Cancels His Next Movie After Script Leaks - zdouf!